It just wouldn’t be the season without some sort of festive gathering of family and friends. Usually, bless their generous souls, some brave couple in my neck of the woods takes on the task of hosting a holiday party. This year, it was me who took the reins and ran with it — and very happily so. You see, the love of my life turned the big 5-0 earlier this month and to celebrate, I decided to throw him a surprise party with 50 of his closest friends. And guess what? It actually worked, with Peter not suspecting a thing until he walked in the door to shouts of “Surprise!” and smelled all the goodies laid out on the dining room table. That’s not to say keeping the biggest secret in recent McKay history wasn’t without its challenges, namely how to keep invitees — and five children — from accidentally blabbing. But because I went with a buffet composed of easy-to-prepare appetizers and a couple of main dishes, the food part ended up being a breeze. Special occasions such as birthdays and the holidays, naturally, call for special dishes. But that doesn’t mean you have to drive yourself crazy with a menu that takes hours, if not days, to prepare. Remember, you’re a guest, too; the best way to prove it is to plan good eats that require little more than heating and assembling once guests arrive, limiting your time in the kitchen. My goal was to pick dishes that could be made and/or assembled in less than 15 minutes, didn’t have to be served piping hot and offered a variety of tastes: salty, sweet, savory and spicy. Every party requires at least one gee-whiz dish, and for Peter’s I was lucky to have two: a horseradish-and-potato-chip-crusted beef tenderloin I roasted early in the afternoon, and beer-batter crepes with ricotta and marinara hand-rolled by my good friend and neighbor Josephine Coletti. (You should be so lucky to have an Italian cook live nearby, but if you’re not, you can always substitute boxed cannelloni.) 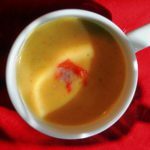 Josephine also whipped up a delicious pumpkin soup, served in small coffee cups with a roasted pepper garnish. Rounding out the menu was a half-dozen appetizers, including an absolutely terrific Asian-style pesto served on a wonton crisp with a sliver of shrimp. Each took no more than 10 minutes to prepare, save for a savory caramelized onion tart that required 25 minutes of baking. But even that, with the filling made the day before, was simply waiting to be popped in the oven once the party got rolling. And roll it did once the group wished my husband a “Happy Birthday!” with a bubbly cranberry-champagne punch. 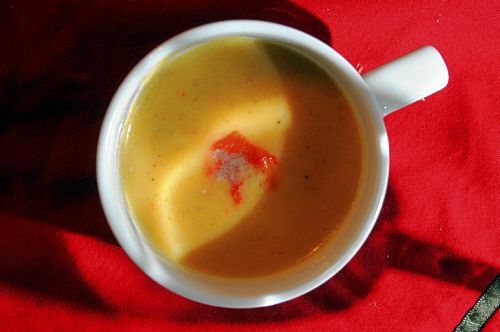 Serve this classic holiday soup in small cups or mugs with handles. If you can’t find fresh pumpkin, substitute any variety of winter squash such as acorn, butternut, banana or hubbard. In a large sauce pot, melt butter and saute the onion until soft. Sprinkle mixture with flour and cook 2 to 3 minutes. Gradually add the chicken stock, stirring until thick and smooth. Add pumpkin, peppers, seasonings and half-and-half or cream. Stir the soup to warm through without boiling. Serve garnished with additional chopped pepper. Mince garlic, 3 tablespoons peanuts and pepper flakes in a food processor. Add cilantro, 3 tablespoons oil, sugar and soy sauce and process to pesto consistency. Heat remaining 1 cup oil over medium heat in a medium skillet. When oil starts to shimmer, add 12 wonton quarters; fry, turning once, until golden brown, about 1 minute. Transfer to a wire rack. Repeat twice with remaining wontons. Just before serving, place a shrimp half on each wonton crisp. Top with a generous 1/4 teaspoon pesto, and garnish with a sprinkling of chopped peanuts. Grated fennel gives this seafood appetizer the tiniest bit of crunch, while creamy mascarpone, an Italian triple-cream cheese, dresses up the toast. Use the best salmon you can afford. Position a rack 6 inches from the broiler and heat the broiler on high. Set the bread on a baking sheet, brush 1 side with the melted butter and season with salt and pepper. Broil the bread until golden brown and crisp on top, 1 to 2 minutes. Flip and cook the other side until golden, about 1 minute. While the bread is still hot, slice off the edges. Let cool slightly. To assemble, spread the toasts with some of the mascarpone and then cut each toast into 4 even rectangles. Top each square with a couple pieces of the fennel, a curl of salmon, a dill frond and a few grinds of pepper. This easy dip will give your vegan guests something to cheer about. Serve with crudites or spread the dip on a flour tortilla with some watercress and grated daikon radish, roll and cut into pinwheels. The vegan ingredients are available at Whole Foods. Put the tomatoes, cream cheese, sour cream, mayonnaise, cayenne, onion powder, garlic powder and salt into a food processor and process until smooth. Serve with the vegetables. Every holiday party calls for at least one fancy-pants dish. I like beef tenderloin because it’s so easy: simply smear on some sort of coating and roast it. This recipe intrigued because it calls for rolling the roast in potato chips, my all-time favorite snack food. I was feeding a crowd, so doubled the ingredients for my 7-pound roast. The original recipe calls for making potato chips from scratch but lazy me substituted store-bought kettle-style chips. Be careful not to add the gelatin until the last moment or the mixture will become unspreadable. Sprinkle roast with 1 tablespoon salt, cover with plastic wrap and let stand at room temperature for 1 hour or refrigerate for up to 24 hours. Adjust oven rack to the middle position and heat oven to 400 degrees. Toss bread crumbs with 2 teaspoons oil, 1/4 teaspoon salt and 1/4 teaspoon pepper in a 10-inch nonstick skillet. Cook over medium heat, stirring frequently, until golden brown, 3 to 5 minutes. Transfer to a rimmed baking sheet and cool to room temperature. Once cooled, toss the bread crumbs with potato chips, shallots, garlic, 2 tablespoons horseradish, parsley and thyme. Pat exterior of the tenderloin dry with paper towels and sprinkle evenly with remaining 1 teaspoon pepper. Heat reserved tablespoon oil in a 12-inch nonstick skillet over medium-high heat until just smoking. Sear the tenderloin until well browned on all sides, 5 to 7 minutes. Transfer to a wire rack set over a rimmed baking sheet and let rest 10 minutes. Combine remaining 2 tablespoons horseradish, mayonnaise and mustard in a small bowl. Just before coating the tenderloin, add gelatin and stir to combine. Spread horseradish paste on the top and sides of the meat, leaving the bottom and ends bare. Roll the coated sides of the tenderloin in the bread-crumb mixture, pressing gently so the crumbs adhere in an even layer that just covers the paste. Pat off any excess. Return the tenderloin to the wire rack. Roast until an instant-read thermometer inserted into the center of the roast registers 120 to 125 degrees for medium-rare, 25 to 30 minutes. Transfer the roast to a carving board and let rest 20 minutes. Carefully cut the meat crosswise into 1/2-inch-thick slices and serve. Place 1 tablespoon Cointreau and 11/2 teaspoons cranberry juice concentrate in each of 8 Champagne flutes. Top with Champagne. Drop 1 cranberry into each cocktail and serve. Thank goodness for neighbors like Josephine Coletti, who prepared this delectable pasta dish (one of three) from scratch. With just three ingredients and two minutes of cooking, the crepes are easier to make than you might think. But you also can substitute boxed cannelloni pasta (try to find De Cecco; it’s delicious). Beat eggs with a pinch of salt and pepper. In another bowl, mix flour with beer, making sure to pour carefully so the beer doesn’t froth. When flour mixture is smooth, carefully fold in the beaten eggs. Heat a lightly oiled 6-inch frying pan over medium-high heat. Pour 2 tablespoons batter into the hot pan. Tilt the pan with a circular motion so that the batter coats the surface evenly. Cook the crepe for about 2 minutes, until the bottom is a light, golden brown. Loosen with a spatula onto a plate (no need to flip). Repeat with remaining batter. Don’t be afraid to stack the crepes; they won’t stick. Beat ricotta with egg in a large bowl. Add parmesan, parsley and prosciutto; salt and pepper to taste. If using prosciutto or salami, add a pinch of hot red pepper flakes. Makes about 2 cups of filling. To assemble: Place about 2 tablespoons of ricotta filling in the middle of a crepe, and spread evenly over the surface. Loosely roll the crepe several times, then place in a lightly sauced baking dish. Be sure to keep the seam down so the crepe doesn’t unravel. Repeat with remaining crepes. Spoon marinara on top of crepes and sprinkle with Parmesan cheese. Bake uncovered at 350 degrees for about 20 to 25 minutes, or until Parmesan starts to turn golden and the sauce bubbles. Or, cover and bake the following day.